in a more complicated system there won't be the odd bug. If NULL use the current database, otherwise give permissions based on the parameter. not have USE statements in them so please take that into account. permissions. Unfortunately at this point only objects in sys.all_objects will work. %'s will be added around the @Principal, @Role, @ObjectName, and @LoginName parameters). -- 9/04/2013 - dbo can’t be added or removed from roles. Don’t script. -- 9/04/2013 - Fix scripts for schema level permissions. -- 10/10/2013 - Added @ObjectName parameter to pull only permissions for a given object. -- 11/18/2013 - Added parameter names to sp_addrolemember and sp_droprolemember. -- 11/19/2013 - Added an ORDER BY to each of the result sets. See above for details. -- 01/04/2014 - Add an ALL option to the DBName parameter. -- 7/15/2014 - Bunch of changes recommended by @SQLSoldier/"https://twitter.com/SQLSoldier"
-- 04/05/2019 - For 'All' DB parameter fix to only look at ONLINE and EMERGENCY DBs. First thank you for this free script. For User-Defined Table Types your script knows they are there but does not identify them Under the ObjectName. And of course it does not generate the GRANT and REVOKE statements. Hopefully you can fix this in your code. Thanks for letting me know. I don’t do much in the way of user defined objects so I didn’t notice. I’ll certainly get it added. If you would like to email me (email is in my about page) I’ll let you know when it’s finished. If I may I would like to report another problem I have. I am trying to delete a db user. I am running your script and copying all the REVOKE statements first. Cannot find the object ‘sysrowsets’, because it does not exist or you do not have permission. I guess the code is not generating the right schema name “mySchema1” and “FROM” I guess should be changed to “TO”. Ok, I believe I have fixed the SCHEMA bug. Give it another shot. It isn’t something I can easily test since it requires a schema and an object to have the same ID but I’m fairly certain I have it. Sorry I just returned to this page now. I updated for your new script and it now works for REVOKE statements. Another bug would be when there is a schema other than the default ‘dbo’ on SPs (I presume perhaps other objects too) the GRANT and REVOKE statements you generate does not include the schema name, not even dbo. Also the column SchemaName is NULL. Ok, the user defined table types are now taken into account and the schemas have been added to object level GRANT and REVOKE statements. Let me know if you see anything else! I haven’t thought this extensively but I believe the parts where you do IF @Print = 1 is wrong. Why do you need to have a different SQL string where you need to @Print or not ? @Principal and @Role are defined as input parameters in the SP so you need their contents in the @SQL string. In any case when I run your SP searching for a principal name, it does not work. The problem is IF @Print = 0, which is the default, the SQL will not put the values of @Principal. I’m surprised you are having a problem. I use it on an almost daily basis. The main difference between the strings when @Print = 1 or not is that if it’s a 0 I’m constructing a string to run in dynamic SQL. If it’s a 1 then I’m constructing a string for that I can print and someone else can run the output. So for example if @print is 1 I have to include some variable declarations that I don’t need to do if I’m not going to print out it. If @print = 0 then I will pass the parameter values in using sp_executesql and I’ll actually put them in the string. You are right the ISNULL(+QUOTENAME is a typo although it appears to work correctly. If you would like to email me at sqlstudent at gmail dot com and maybe send me some specifics about what you are trying to do I’d love to figure it out. Sorry my mistake. I tried again yesterday and it seems that if the SP is not on the master DB, I had it created on a USER DB, then it doesn’t work. If it is created on the master DB, it works. I do not know why exactly, I didn’t investigate. how is the best way to copy this script? Unfortunately the plugin I’m using doesn’t have a copy button like some do. Typically I click in the top left corner of the script, scroll down and hold down the shift key while clicking on the bottom right of the script. If that’s still giving you issues you can email me and I’ll email you back with a link to an easier version to copy. Is there a way to use sp_dbpermissions to save the results to tables? The need is to save database users, their roles and explicitly granted permissions saved somewhere so they can be later restored elsewhere. users_db_roles would have a row for each user and the role they are member of such as db_datareader. That’s a really good idea. I’ll add it to my next release (probably early next year). In the mean time you can use the @print option to print out the SQL and just add an insert into manually. Fair warning, while you can print out the code for the ‘ALL’ option it isn’t correct. I’ll try to get that fixed also. Wow, you’ve put a lot of effort into these db and server permissions procedures; many thanks for sharing! Thanks! Hope they are as useful to you as they are to me. I also noticed that when you don’t choose the ALL option, the USE DATABASE doesn’t show up in the output. So instead of having USE DATABASE; CREATE USER someuser you just get CREATE USER someuser. This causes problems when restoring if you have not selected the appropriate database before running the create and grant statements. That’s actually deliberate. One of the purposes of the scripts is to be able to move them from one DB to another. So I assume that you will run them in the correct DB context. In the case of the ‘ALL’ option that doesn’t really apply since it’s across multiple databases. I am planning to use this to generate scripts automatically prior to refreshing db. Is there a why to dump the necessary columns from the 3 results into a sql script so it can be used as a post refresh script ? Unfortunately there is no easy way to do it. You can script out the queries used and modify them with the @print parameter but it doesn’t work well with the ALL parameter. Hi again Kenneth. I used sp_dbpermissions to create a process that archives permissions for an instance to three tables in msdb. Then I created another process that can use those same tables to restore permissions as they were on any given date. I would definitely like to share the work with you if you’re interested. Sure thing. Love to see it. 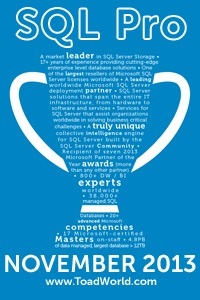 Send it to my email address sqlstudent144 at gmail. Can you share your restore permissions script with me? My email: WUYZ@hotmail dot com. Thanks. Hi Craig, can you share your script. Thanks! Could you please send me a copy? This would help us solve a big headache. Send to jrodriguez@cppib.com please and thank you! I don’t have a restore process built in but there is now a parameter @DropTempTables that can be set to 0 to keep the existing temp tables. That way you can easily run the SP and save off the results right afterwards. Is there a way to use this to list out information for a matching pattern of databases? like using wildcards? No, currently it’s one DB or all of them. I do need to work on it though so I can add that to my list of future features. This shows my ignorance … but I quickly tried running your script and did not get my expected results. I assumed that your script did not work for certificate and symmetric keys. But I did not see your USE MASTER at the top. Realize that you can pass in the DBName parameter, but that USE MASTER took me off guard as I was quickly googling and trying to find something that could handle my securables. Guess my suggestion is to remove the USE MASTER. It doesn’t matter what DBName you use it will run for that DB without having to create it multiple times or use a 3 part name. again … my ignorance. So the sproc with a prefix of ‘sp_’ will look in the current context first and if not found then in the master? Always wondered why sp_whoisactive could be run from any database. Actually I think it’s the opposite. It checks master first then current context. But I could certainly be wrong. 🙂 It’s a common trick used. It’s also a good reason why you shouldn’t name regular SPs sp_. *nod* I probably have those excluded I’m afraid. Mostly due to my own ignorance. I don’t use keys enough to be certain of getting it right or even being able to create good test cases. How did you exclude them? what part of the script would I look at? Hmm, I looked and in that 3rd section I don’t have any exclusions so I don’t see why it’s not working. You could try setting @Print=1 and it will print out the queries it runs. Concentrate on the 3rd query and see what you can find. If you can find the bug I’ll certainly get it fixed and happily give you credit. Fixed w credit! I feel better because it looks like it’s a bug in the documentation. If you look at BOL for sys.database_permissions you’ll see them listed without the Ss. I assumed that it would be asymmetric_keys, but it is not – as you already must know. ok, cannot remember exactly if I used the @Print=1 or added a SELECT (because the PRINT output was truncating), but I took some of the printed code and mashed it into a script. Well the CHAR(13) with out the CHAR(10) causes the SQL debugger fits. The debugger would not step past the CTE ObjectList. Spent a lot of time trying to figure out what was up with the debugger (I am a debugger manac). Finally took the script and replaced all single CHAR(13) with CHAR(13) + CHAR(10) and the debugger started working correctly. Just an FYI. I really need to do a bunch of work on it so I’ll add that to the list. Maybe make an @lf var so people can modify it as they need. Sorry to be a pest. The symmetric keys is not exactly right. Not both are plural. the REVOKE and GRANT should not have plural. It’s not showing up object level permissions on the Views of the database. Am i missing something? Glad to hear it! Hope you are finding the whole thing helpful. Found one minor issue; when setting @Print = 1, the third (database & Object permissions) section’s query gets truncated. This can be resolved by commenting out line 739 and inserting the following two lines between lines 740 and 741.
do you have an email address? I have a version of your script with column permissions added that I would like to send for your review. CreateOnly – Only return the create scripts where they aren’t NULL. DropOnly – Only return the drop scripts where they aren’t NULL. ScriptsOnly – Return drop and create scripts where they aren’t NULL. Script is actually looking for ‘ScriptOnly’ and not ‘ScriptsOnly’. Just to let you know I am still using this script and thank you for maintaining it.